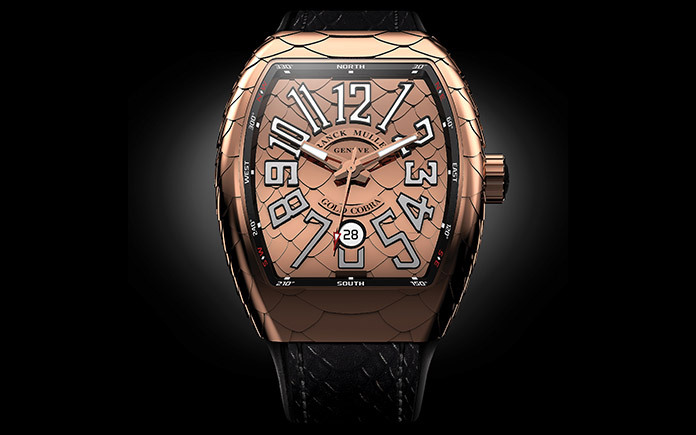 The fascinating world of reptile has always been a source of inspiration for Franck Muller. Following the success of the Croco Collection by Franck Muller, the manufacture now introduces the Vanguard Cobra – this distinctive collection features a case and a dial adorned with 3D cobra scales. The perfect continuity between the case, the dial and the strap creates a striking uniformity. The Cobra Collection by Franck Muller is entirely conceived and assembled by the master watchmakers at Franck Muller. The scales have been milled from a mass of 18 carat rose gold or stainless steel to create the most realistic cobra scales aspect. The eye- catching cobra scales emphasize the stylish and sporty character of the Vanguard. This new collection is complemented by a rubber and leather cobra effect strap. Housing either an automatic or a manual movement and offering a power reserve of 42 hours, the Cobra Collection by Franck Muller will enchant watch afficionados with an eye for style.